At Puro Chile, everything comes from Chile. Celebrating Chile's cultural past and present through Chilean food, wine and art. On display in this museum-style boutique, are many attractive objects depicting one country's love, for beauty throughout history. Authentic hand-made native Mapuche silver jewelry is sold alongside of more contemporary designer pieces created by today's generation of young artists — woven horse hair jewelry is as intricate as it is interesting, consisting of small woven hollow spheres that are worked with like beads, made into earrings and necklaces. Enjoy the unparalleled taste of Chilean foods with delicious Murat berry spread, fruit juices, jarred goods, natural and infused olive oils (for as little as $4), honey and smoked sea salts. In the freezer, priced to sell for tonight's dinner, are the imported flash-frozen hormone-free grass-fed meats and salmon steaks. An artist's interpretation of a dividing wall is nothing short of installation art. Separating Puro's boutique from Puro Wine are the wonderfully colored wine bottles neatly displayed and stacked to the ceiling behind the adjoining glass wall. At this purely Chilean Wine shop, prices begin as low as $11 and as high as $120, with the average bottle selling for $28. Daily from 12:00 p.m. to 7:00 p.m. Imported Chilean foods, fruits and condiments. Cultural books, native art, hand-made jewelry and home goods. 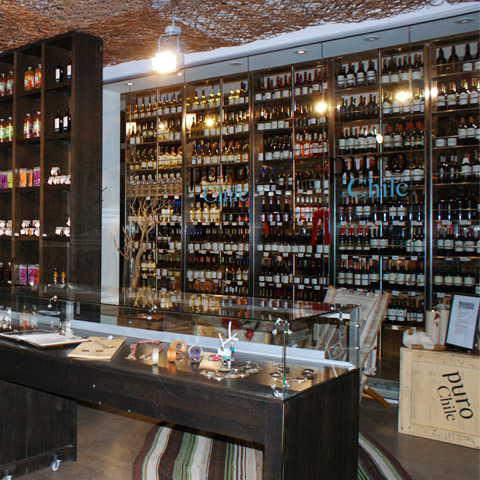 For wine lovers there is a purely Chilean wine store next door.